With private and public schools opening this week, BVI Football Association has put its after school program on hold, following the destruction caused to the territory during the passage of Hurricane Irma on Sept 6, followed by Maria on Sept 19. During Irma, the association’s new pitch in Long Look was lifted from its boundary on the northern end and the goal posts broken off. The A.O. 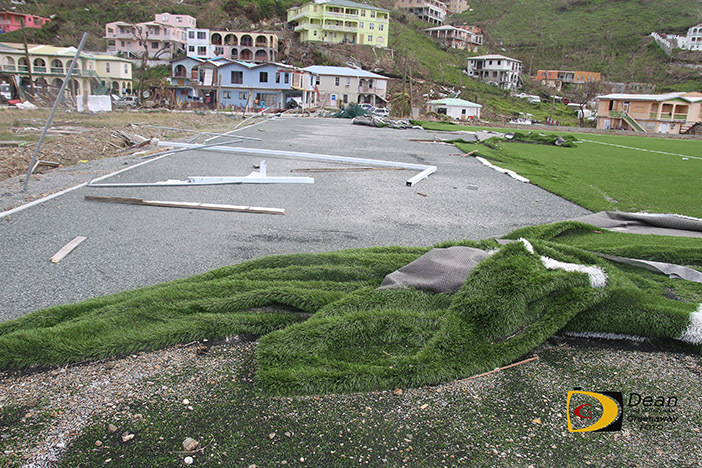 Shirley Grounds where matches were played in town as well as the Althea Scatliffe School Grounds were also damaged as well as other grounds throughout the territory. The Shirley Grounds are currently being used by the Royal British Marines as a landing base for its helicopters and ferrying relief supplies. The BVIFA is optimistic that Football will be played in the territory before year end, with the BDO Primary School’s League and the High School League on hold with a possible start date of early 2018. According to a BVIFA statement, meetings will take place over the coming days to see how best to engage the youths in Football, once there’s a safe environment to rebuild the After School Program, which will continue to provide a meaningful avenue for youngsters to stay fit, healthy and also provide a welcomed relief from the day to day stress caused by the Hurricanes. With only a limited number of schools to be in operation following Irma’s damage and a shift system being put in place, it poses a major challenge for the BVIFA in getting its program off the ground. The BVIFA will be looking to reestablish its database and contact all those who have been involved in the game and aspire to reach representative levels. According to the statement, one of the most important tasks is so actually see how many players are still in the country and they track down those who have left.